Mithra was the only Iranian god that was introduced into the Occident, and that everything in his religion that does not relate directly to him was adventitious and recent. This is a gratuitous and erroneous supposition. Mithra was accompanied in his migrations by a large representation from the Mazdean Pantheon, and if he was in the eyes of his devotees the principal hero of the religion to which he gave his name, he was nevertheless not its Supreme God. MITHRAIC KRONOS (ÆON, OR INFINITE TIME). the zodiac engraved on his body and the emblems of the seasons that accompany them, are meant to represent the celestial and terrestrial phenomena that signalize the eternal flight of the years. He creates and destroys all things; he is the Lord and master of the four elements that compose the universe, he virtually unites in his person the power of all the gods, whom he alone has begotten. Sometimes he is identified with Destiny, at others with the primitive light or the primitive fire; while both conceptions rendered it possible for him to be compared with the Supreme Cause of the Stoics,--the heat which pervades all things, which has shaped all things, and which under another aspect was Fatality (Εἱμαρμένη). See Figs. 20-23; also Fig. 49.
of all events, appear at times to have been confounded with the eternal Destiny. These three cosmic divinities were personified under other names less transparent. The Heavens were naught less than Ormazd or Jupiter, the Earth was identified with Speñta-Armaîti or Juno, and the Ocean was similarly called Apâm-Napât or Neptune. Like the Greek theogonies, so the Mithraic traditions narrated that Zeus succeeded Kronos, the king of the first ages, in the government of the world. 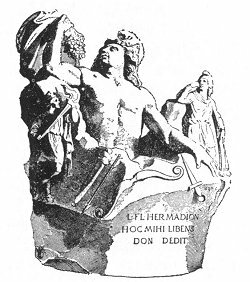 The bas-reliefs show us this Mazdean Saturn placing in the hands of his son the thunderbolts which were the symbol of his sovereign power. Henceforward Jupiter with his consort Juno was to reign over all the other gods, all of whom owe to this couple their existence. 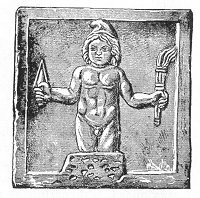 hymns celebrated; Shahrîvar or Mars, who was the god of the metals and succored the pious warrior in his combats; Vulcan or Atar, the genius of fire; Mercury, the messenger of Zeus; Bacchus or Haoma, the personification of the plant that furnished the sacred drink; Silvanus or Drvâspa, protector of horses and agriculture; then Anaïtis, the goddess of the fecundating waters, who has been likened to Venus and Cybele and who, presiding over war, was also invoked under the name of Minerva; Diana or Luna, who made the honey which was used in the purifications; Vanaiñiti or Nike, who gave victory to kings; Asha or Arete, perfect virtue; and others besides. This innumerable multitude of divinities was enthroned with Jupiter or Zeus on the sun-tipped summits of Mt. Olympus and composed the celestial court. Contrasted with this luminous abode, where dwelt the Most High gods in resplendent radiance, was a dark and dismal domain in the bowels of the earth. Here Ahriman or Pluto, born like Jupiter of Infinite Time, reigned with Hecate over the maleficent monsters that had issued from their impure embraces. 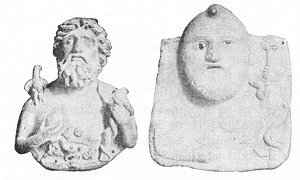 FRAGMENTS OF A BAS-RELIEF IN WHITE ITALIAN MARBLE. which they had risen (Figure 24). They made their escape, however, from that place and wandered about on the surface of the earth, there to spread misery and to corrupt the hearts of men, who, in order to ward off the evils that menaced them, were obliged to appease these perverse spirits by offering them expiatory sacrifices. The initiate also knew how by appropriate rites and incantations to enlist them in his service and to employ them against the enemies whose destruction he was meditating. The gods no longer confined themselves to the ethereal spheres which were their appanage. If theogony represents them as gathered in Olympus around their parents and sovereigns, cosmology exhibits them under another aspect. Their energy filled the world, and they were the active principles of its transformations. Fire, personified in the name of Vulcan, was the most exalted of these natural forces, and it was worshipped in all its manifestations, whether it shone in the stars or in the lightning, whether it animated living creatures, stimulated the growth of plants, or lay dormant in the bowels of the earth. In the deep recesses of the subterranean crypts It burned perpetually on the altars, and its votaries were fearful to contaminate its purity by sacrilegious contact. they entertained the same superstitious respect for the one as for the other. They worshipped alike the saline floods which filled the deep seas and which were termed indifferently Neptune and Oceanus, the springs that gurgled from the recesses of the earth, the rivers that flowed over its surface, and the placid lakes resplendent in their limpid sheen. A perpetual spring bubbled in the vicinity of the temples, and was the recipient of the homage and the offerings of its visitors. This font perennial (fons perennis) was alike the symbolization of the material and moral boons that the inexhaustible generosity of Infinite Time scattered throughout the universe, and that of the spiritual rejuvenation accorded to wearied souls in the eternity of felicity. The primitive earth, the nourishing earth, the mother earth (terra mater), fecundated by the waters of Heaven, occupied a like important place, if not in the ritual, at least in the doctrine of this religion; and the four cardinal winds which were correlated with the deified Seasons were invoked as genii to be both feared and loved: feared because they were the capricious arbiters of the temperature, which brought heat or cold, tempests or calms, which alternately moistened and dried the atmosphere, which produced the vegetation of the spring and withered the foliage of the autumn,--and loved as the diverse manifestations of the air itself, which is the principle of all life. In other words, Mithraism deified the four simple bodies which, according to the physics of the ancients, composed the universe. An allegorical group, often reproduced, in which a lion represented fire, a cup water, a serpent the earth, pictured the struggle of the opposing elements, which were constantly devouring one another and whose perpetual transmutations and infinitely variable combinations provoked all the phenomena of nature (Fig. 25). 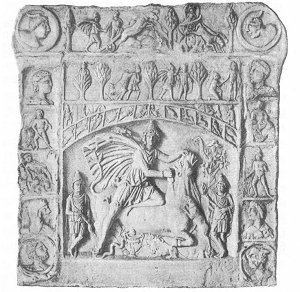 GRAND MITHRAIC BAS-RELIEF OF HEDDERNHEIM, GERMANY. is transformed. The steeds interchange natures in such wise that the substance of all passes over to the most robust and ardent of the group, just as if a sculptor, after having modelled figures in wax, had borrowed the attributes of one to complete the others, and had ended by merging all into a single form. Then, the conquering steed in this divine struggle, having become by his triumph omnipotent, is identified with the charioteer himself. The first horse is the incarnation of fire or ether, the second of air, the third of water, and the fourth of the earth. The accidents which befall the last-mentioned horse, the earth, represent the conflagrations and inundations which have desolated and will in the future desolate our world; and the victory of the first horse is the symbolic image of the final conflict that shall destroy the existing order of all things. accorded to the Moon, which voyaged in the spheres above on a cart drawn by white bulls. The animal of reproduction and of agriculture had been assigned to the goddess that presided over the increase of plants and the generation of living creatures. The elements, accordingly, were not the only natural bodies that were deified in the Mysteries. The two luminaries that fecundated nature were worshipped here the same as in primitive Mazdaism, but the conceptions which the Aryas formed of them have been profoundly transformed by the influences of Chaldæan theories. the same truth, the clergy reserved for the élite exclusively the revelation of the original Mazdean doctrines concerning the origin and destiny of man and the world, whilst the multitude were forced to remain content with the brilliant and superficial symbolism inspired by the speculations of the Chaldæans. The astronomical allegories concealed from the curiosity of the vulgar the real scope of the hieratic representations, and the promise of complete illumination, long withheld, fed the ardor of faith with the fascinating allurements of mystery. under the aspect of the immortal gods throned on the Greek Olympus: Helios, Selene, Ares, Hermes, Zeus, Aphrodite, Kronos. 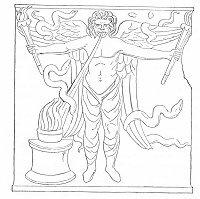 But these images have here an entirely different signification from what they possess when they stand for Ahura-Mazda, Zervan, or the other gods of Mazdaism. Then the personifications of the Heavens or of Infinite Time are not seen in them, but only the luminous stars whose wandering course can be followed amid the constellations. This double system of interpretation was particularly applied to the Sun, conceived now as identical with Mithra and now as distinct from him. In reality there were two solar divinities in the Mysteries, one Iranian and the heir of the Persian Hvare, the other Semitic, the substitute of the Babylonian Shamash, identified with Mithra. MARBLE BAS-RELIEF FOUND IN LONDON. After Chiflet, reproduced from C. W. King. trolled the existence of men and guided the Course of things. became the Supreme Being which engendered all things and ruled the universe. The development of the universe is subject to immutable laws and its various parts are united in the most intimate solidarity. The position of the planets, their mutual relations and energies, at every moment different, produce the series of terrestrial phenomena. Astrology, of which these postulates were the dogmas, certainly owes some share of its success to the Mithraic propaganda, and Mithraism is therefore partly responsible for the triumph in the West of this pseudo-science with its long train of errors and terrors. the title "Magus" became in the popular mind, not without good reason, a synonym for "magician." Yet neither the conception of an inexorable necessity unpityingly forcing the human race toward an unknown goal, nor even the fear of malevolent spirits bent on its destruction, was competent to attract the multitudes to the altars of the Mithraic gods. The rigor of these somber doctrines was tempered by a belief in benevolent powers sympathizing with the sufferings of mortals. Even the planets were not, as in the didactic works of the theoretical astrologists, cosmic powers whose favorable or sinister influence waxed great or diminished conformably to the revolutions of a circle fixed for all eternity. They were, as in the doctrine of the old Chaldæan religion, divinities that saw and heard, that rejoiced or lamented, whose wrath might be appeased, and whose favor might be gained by prayers and by offerings. The faithful reposed their confidence in the support of these benevolent protectors who combated without respite the powers of evil. 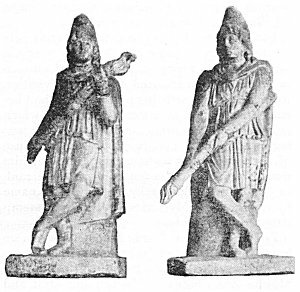 of Verethraghna, the Mazdean Hercules, were chanted in Armenia. 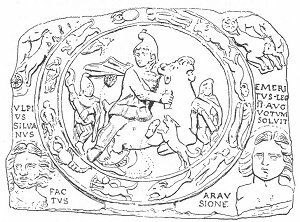 It is told here how he strangled the dragons and aided Jupiter in his triumphant combat with the monstrous giants; and like the votaries of the Avesta, the Roman adepts of Mazdaism compared him to a bellicose and destructive boar. But the hero that enjoyed the greatest rôle in these warlike tales was Mithra. Certain mighty deeds, which in the books of Zoroastrianism were attributed to other divinities, were associated with his person. He had become the center of a cycle of legends which alone explain the preponderant place that was accorded him in this religion. It is because of the astounding feats accomplished by him that this god, who did not hold supreme rank in the celestial hierarchy, has given his name to the Persian Mysteries that were disseminated in the Occident. and the Greek philosophers also saw in the glittering globe that poured down upon this world its light, the ever-present image of the invisible Being, of whom reason alone could conceive the existence. MITHRA BORN FROM THE ROCK. a torch that had illuminated the somber depths. below (Fig. 30). Worshipfully the shepherds drew near, offering the divine infant the first fruits of their flock and their harvests. But the young hero was naked and exposed to the winds that blew with violence: he had concealed himself in the branches of a fig-tree, and detaching the fruit from the tree with the aid of his knife, he ate of it, and stripping it of its leaves he made himself garments. Thus equipped for the battle, he was able henceforward to measure his strength with the other powers, that peopled the marvellous world into which he had entered. For although the shepherds were pasturing their flocks when he was born, all these things came to pass before there were men on earth. The god with whom Mithra first measured his strength was the Sun. The latter was compelled to render homage to the superiority of his rival and to receive from him his investiture. His conqueror placed upon his head the radiant crown that he has borne in his daily course ever since his downfall. Then he caused him to rise again, and extending to him his right hand concluded with him a solemn covenant of friendship. And ever after, the two allied heroes faithfully supported each other in all their enterprises (Fig. 32). 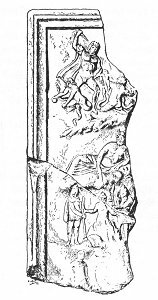 FRAGMENT OF THE BAS-RELIEF OF VIRUNUM. THE TAUROCTONOUS (BULL-SLAYING) MITHRA AND THE TAUROPHOROUS (BULL-BEARING) MITHRA; BETWEEN THEM THE DOG. veneration. In the eyes of such a people, the capture of a wild bull was an achievement so highly fraught with honor as to be apparently no derogation even for a god. The redoubtable bull was grazing in a pasture on the mountain-side; the hero, resorting to a bold stratagem, seized it by the horns and succeeded in mounting it. The infuriated quadruped, breaking into a gallop, struggled in vain to free itself from its rider; the latter, although unseated by the bull's mad rush, never for a moment relaxed his hold; he suffered himself to be dragged along, suspended from the horns of the animal, which, finally exhausted by its efforts, was forced to surrender. Its conqueror then seizing it by its hind hoofs, dragged it backwards over a road strewn with obstacles (Fig. 33) into the cave which served as his home. by the nostrils with one hand, with the other he plunged deep into its flank his hunting-knife. Then came an extraordinary prodigy to pass. us our bread, and from its blood the vine that produces the sacred drink of the Mysteries. In vain did the Evil Spirit launch forth his unclean demons against the anguish-wrung animal, in order to poison in it the very sources of life; the scorpion, the ant, the serpent, strove in vain to consume the genital parts and to drink the blood of the prolific quadruped; but they were powerless to impede the miracle that was enacting. 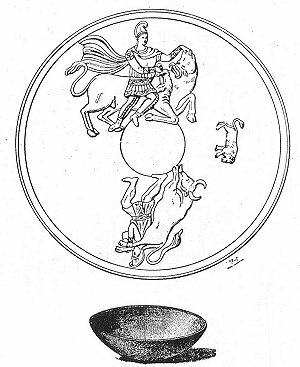 The seed of the bull, gathered and purified by the Moon, produced all the different species of useful animals, and its soul, under the protection of the dog, the faithful companion of Mithra, ascended into the celestial spheres above, where, receiving the honors of divinity, it became under the name of Silvanus the guardian of herds. Thus, through the sacrifice which he had so resignedly undertaken, the tauroctonous hero became the creator of all the beneficent beings on earth; and, from the death which he had caused, was born a new life, more rich and more fecund than the old. aid of his ever-victorious adversary. The divine archer discharged his arrows against a precipitous rock, and here gushed forth from it a spring of living water to which the suppliants thronged to cool their parched palates. 1 But a still more terrible cataclysm followed, which menaced all nature. A universal deluge depopulated the earth, which was overwhelmed by the waters of the rivers and the seas. One man alone, secretly advised by the gods, had constructed a boat and had saved himself, together with his cattle, in an ark which floated on the broad expanse of waters. Then a great conflagration ravaged the world and consumed utterly both the habitations of men and of beasts. But the creatures of Ormazd also ultimately escaped this new peril, thanks to celestial protection, and henceforward the human race was permitted to wax great and multiply in peace. The heroic period of history was now closed, and the terrestrial mission of Mithra accomplished. In a Last Supper, which the initiated commemorated by mystical love feasts, he celebrated with Helios and the other companions of his labors the termination of their common struggles. Then the gods ascended to the Heavens. Borne by the Sun on his radiant quadriga, Mithra crossed the Ocean, which sought in vain to engulf him (Fig. 35), and took up his habitation with the rest of the immortals. But from the heights of Heaven he never ceased to protect the faithful ones that piously served him. This mythical recital of the origin of the world enables us to understand the importance which the tauroctonous god enjoyed in his religion, and to comprehend better what the pagan theologians endeavored to express by the title "mediator." Mithra is the creator to whom Jupiter-Ormazd committed the task of establishing and of maintaining order in nature. He is, to speak in the philosophical language of the times, the Logos that emanated from God and shared His omnipotence; who, after having fashioned the world as demiurge, continued to watch faithfully over it. The primal defeat of Ahriman had not reduced him to absolute impotence; the struggle between the good and the evil was still conducted on earth between the emissaries of the sovereign of Olympus and those of the Prince of Darkness; it raged in the celestial spheres in the opposition of propitious and adverse stars, and it reverberated in the hearts of men,--the epitomes of the universe. the world to come? Our incertitude on these points is extreme, for we have not the shadow of a right to identify the precepts revealed in the Mysteries with those formulated in the Avesta. Nevertheless, it would appear certain that the ethics of the Magi of the Occident had made no concession to the license of the Babylonian cults and that it had still preserved the lofty character of the ethics of the ancient Persians. Perfect purity had remained for them the cult toward which the life of the faithful should tend. Their ritual required repeated lustrations and ablutions, which were believed to wash away the stains of the soul. This catharsis or purification both conformed to the Mazdean traditions and was in harmony with the general tendencies of the age. Yielding to these tendencies, the Mithraists carried their principles even to excess, and their ideals of perfection verged on asceticism. Abstinence from certain foods and absolute continence were regarded as praiseworthy. 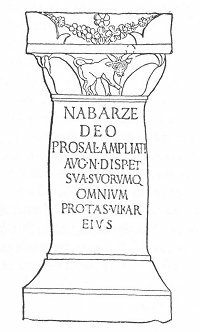 VOTIVE INSCRIPTION TO MITHRA NABARZE (VICTORIOUS). cruelty in their ethics. A religion of soldiers, Mithraism exalted the military virtues above all others. 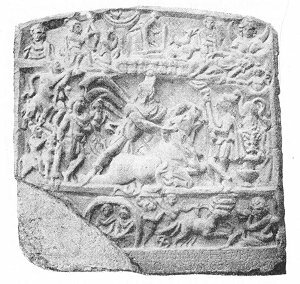 demons, he is assisted by Mithra. Mithra is the god of help, whom one never invokes in vain, an unfailing haven, the anchor of salvation for mortals in all their trials, the dauntless champion who sustains his devotees in their frailty, through all the tribulations of life. As with the Persians, so here he is still the defender of truth and justice, the protector of holiness, and the intrepid antagonist of the powers of darkness. Eternally young and vigorous, he pursues them without mercy; "always awake, always alert," it is impossible to surprise him; and from his never-ceasing combats he always emerges the victor. This is the idea that unceasingly occurs in the inscriptions, the idea expressed by the Persian surname Nabarze (Fig. 36), by the Greek and Latin epithets of ἀνίκητος, invictus, insuperabilis. As the god of armies, Mithra caused his protégés to triumph over their barbarous adversaries, and likewise in the moral realm he gave them victory over the instincts of evil, inspired by the Spirit of Falsehood, and he assured them salvation both in this world and in that to come. Like all the Oriental cults, the Persian Mysteries mingled with their cosmogonic fables and their theological speculations, ideas of deliverance and redemption. They believed in the conscious survival after death of the divine essence that dwells within us, and in punishments and rewards beyond the tomb. The souls, of which an infinite multitude peopled the habitations of the Most High, descended here below to animate the bodies of men, either because they were compelled by bitter necessity to fall into this material and corrupt world, or because they had dropped of their own accord upon the earth to undertake here the battle against the demons. When after death the genius of corruption took possession of the body, and the soul quitted its human prison, the devas of darkness and the emissaries of Heaven disputed for its possession. A special decree decided whether it was worthy to ascend again into Paradise. If it was stained by an impure life, the emissaries of Ahriman dragged it down to the infernal depths, where they inflicted upon it a thousand tortures; or perhaps, as a mark of its fall, it was condemned to take up its abode in the body of some unclean animal. If, on the contrary, its merits outweighed its faults, it was borne aloft to the regions on high. It was Mithra, the protector of truth, that presided over the judgment of the soul after its decease. It was he, the mediator, that served as a guide to his faithful ones in their courageous ascent to the empyrean; he was the celestial father that received them in his resplendent mansion, like children who had returned from a distant voyage. minds. Another belief, which was added to the first by a sort of superftation, offered the prospect of more material enjoyment. The doctrine of the immortality of the soul was rounded off by the doctrine of the resurrection of the flesh. The struggle between the principles of good and evil is not destined to continue into all eternity. When the age assigned for its duration shall have rolled away, the scourges sent by Ahriman will compass the destruction of the world. A marvellous bull, analogous to the primitive bull, will then again appear on earth, and Mithra will redescend and reawaken men to life. All will sally forth from the tombs, will assume their former appearance, and recognize one another. Humanity entire will unite in one grand assembly, and the god of truth will separate the good from the bad. Then in a supreme sacrifice, he will immolate the divine bull; will mingle its fat with the consecrated wine, and will offer to the just this miraculous beverage which will endow them all with immortality. Then Jupiter-Ormazd, yielding to the prayers of the beatified ones, will cause to fall from the heavens a devouring fire which will annihilate all the wicked. The defeat of the Spirit of Darkness will be achieved, and in the general conflagration Ahriman and his impure demons will perish and the rejuvenated universe enjoy unto all eternity happiness without end. We who have never experienced the Mithraic spirit of grace are apt to be disconcerted by the incoherence and absurdity of this body of doctrine, such as it has been shown forth in our reconstruction. A theology at once naive and artificial here combines primitive myths, the naturalistic tendency of which is still transparent, with an astrological system whose logical structure only serves to render its radical falsity all the more palpable. All the impossibilities of the ancient polytheistic fables here subsist side by side with philosophical speculations on the evolution of the universe and the destiny of man. The discordance between tradition and reflection is extremely marked here and it is augmented by the contrariety between the doctrine of fatalism and that of the efficacy of prayer and the need of worship. But this religion, like any other, must not be estimated by its metaphysical verity. It would ill become us to-day to dissect the cold corpse of this faith in order to ascertain its inward organic vices. The important thing is to understand how Mithraism lived and grew great, and why it failed to win the empire of the world. sacred army charged with sustaining with the Principle of Good the struggle against the power of evil, was singularly adapted to provoking their most pious efforts and transforming them into ardent zealots. The Mysteries exerted another powerful influence, also, in fostering some of the most exalted aspirations of the human soul: the desire for immortality and the expectation of final justice. The hopes of life beyond the tomb which this religion instilled in its votaries were one of the secrets of its power in these troublous times, when solicitude for the life to come disturbed all minds. was, in this respect, nothing but the religious expression of the physics and astronomy of the Roman world. This theoretical conformity of revealed dogmas with the accepted ideas of science was calculated to allure cultivated minds, but it had no hold whatever upon the ignorant souls of the populace. These, on the other hand, were eminently amenable to the allurements of a doctrine that deified the whole of physical and tangible reality. The gods were everywhere, and they mingled in every act of life; the fire that cooked the food and warmed the bodies of the faithful, the water that allayed their thirst and cleansed their persons, the very air that they breathed, and the light that illuminated their paths, were the objects of their adoration. Perhaps no other religion ever offered to its sectaries in a higher degree than Mithraism opportunities for prayer and motives for veneration. When the initiated betook himself in the evening to the sacred grotto concealed in the solitude of the forests, at every step new sensations awakened in his heart some mystical emotion. The stars that shone in the sky, the wind that whispered in the foliage, the spring or brook that babbled down the mountain-side, even the earth that he trod under his feet, were in his eyes divine, and all surrounding nature provoked in him a worshipful fear for the infinite forces that swayed the universe. 119:1 See supra, page 10. 127:1 See supra, page 10. 131:1 See the lower part of Fig. 24. 138:1 See supra, p. 117, Fig. 25, and infra, p. 196, Fig. 45. 145:1 This Mithraic doctrine has recently been compared with other analogous beliefs and studied in detail by M. Bossuet. "Die Himmelreise der Seele" (Archiv für Relikionswissenschaft, Vol. IV., 1901, p. 160 ff. ).